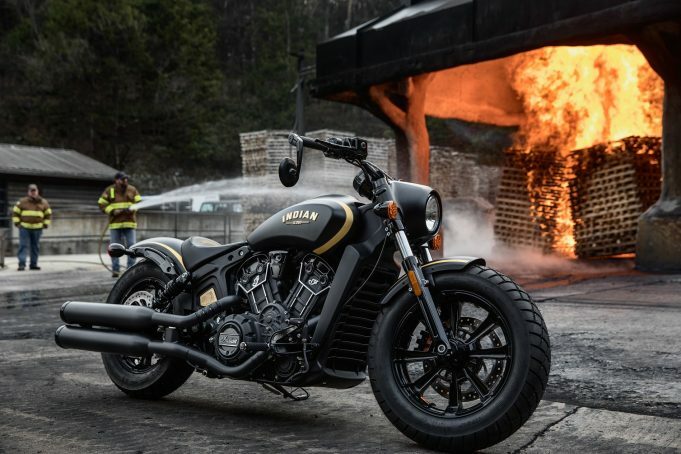 BLACKED out and stripped down is the best way to describe Indian Motorcycle’s new 2018 Limited Edition Scout Bobber; a bike built in partnership with Jack Daniel’s and Klock Werks Kustom Cycles of Mitchell to honour emergency services first responders. The ultra-premium, limited-edition motorcycle draws inspiration from the black and gold fire trucks from legendary bourbon distiller Jack Daniel’s Fire Brigade and boasts several custom features that create a truly unique motorcycle. As a nod to the Old No. 7 Brand, only 177 of these bikes will be built globally, making anyone who owns one of the individually-numbered motorcycles a member of an extremely exclusive club. The bike has subtle two-tone matte black paint, a first for Indian Motorcycle, and is covered in real 24-karat gold graphics on the tank and fenders. The 24-karat gold carries through to the Fire Brigade emblem on the tank. Likewise, the Bottles and Throttles Don’t Mix emblem on the front fender is also 24-karat gold. Other custom details include a perforated genuine leather seat with Jack Daniel’s embroidery and custom grips, pegs, and shift levers inspired by the Old No. 7 Brand. Premium gloss black finishes on the fender struts, hand control levers, engine valve covers, and exhaust tips, while a gold coloured Indian Scout badge further showcases the attention to detail given in the design of this limited-edition bike. Also unique is a one-of-a-kind Montana Silversmith badge that’s individually numbered and coated with 24-karat gold. In addition to the bike’s custom accents, it also features chopped fenders, vented exhaust shields, knobby tires and a sleek headlight nacelle. To reserve a 2018 Jack Daniel’s Limited Edition Indian Scout Bobber visit or call your local Indian Motorcycle dealership. It’s priced from $24,995 ride away. We should warn you though, the 2016 Jack Daniel’s Limited Edition Indian Springfield and Chief Vintage models sold out in less than 8 hours, while the 2017 Jack Daniel’s Limited Edition Indian Chieftain sold out in less than 10 minutes.